valuable skills taught are how to avoid incidents in the first place. To gain the maximum benefit from this class, you should be comfortable in class II whitewater and carry a throw rope - one of the basic tools of this trade. Classes are typically held locally. 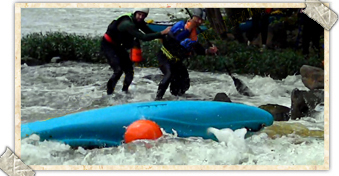 The two-day class is a mix of classroom, land based, and swift water exercises. This class can be strenuous, especially the whitewater exercises. Lead instructors are ACA certified. Class size is very limited so reserve your spot early - first come, first served. Each paddler is responsible for their own gear and the instructors will inspect and provide guidance. In addition, each student should bring their own throw rope. For more detailed (essential) information about this class, click here. Do you have questions, or need additional information?